We arrived at LAX at about 9:30 local time (which was 12:30 our time) after a pretty good flight out. We were picked up by our handler for the week, Pamela, and informed that the two other educators flying with us, Jackie and Melissa, would be arriving from D.C. and New York soon. We grabbed “breakfast” which was really lunch for us, and then waited their arrival. Once we were all loaded into the van, we made our way to the California Science Center. 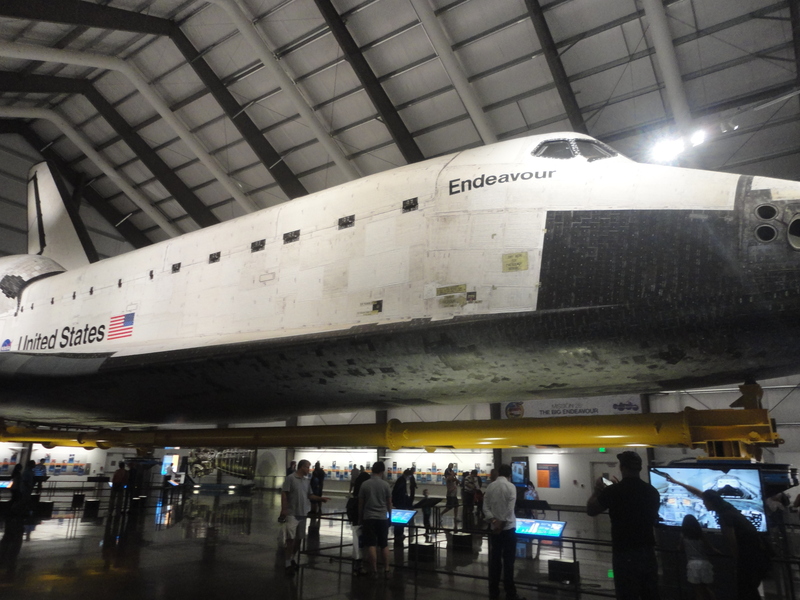 Here we got to see the Space Shuttle Endeavor and tour some of their other space craft. The Space Shuttles were assembled at the facility where we will be spending our week, so it was very interesting to read all the history behind the different shuttle missions. We did some pretty cool science with these bad boys. Go USA! Unfortunately, the shuttle program ceased operation in 2011. So the Endeavor is retired here. 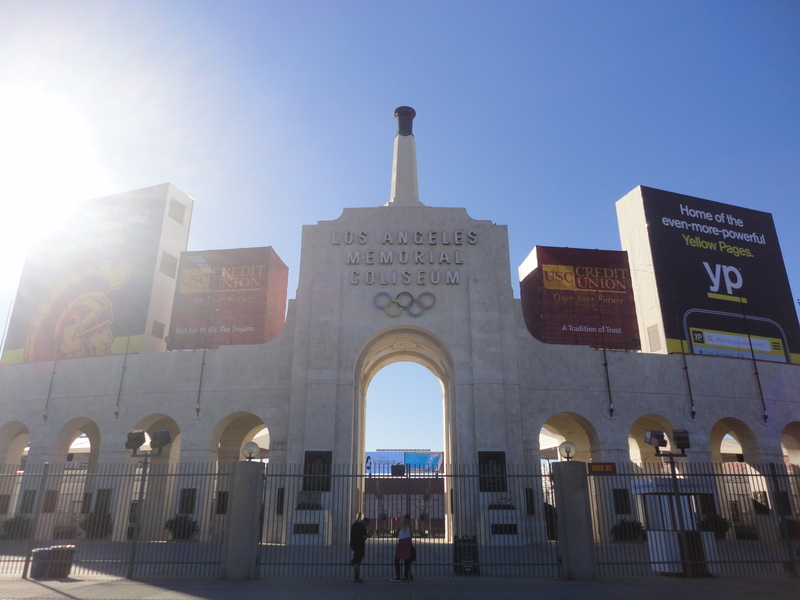 Since the California Science Center is right next to USC and also the Los Angeles Memorial Coliseum, we stopped for a quick photo. Pamela then gave us some briefings on our week while we drove the hour long drive from Los Angeles to Palmdale where we will be spending our week at NASA’s Armstrong Flight Research facility, which is located just down the road from Edwards Air Force Base. On the way, we made a quick stop at the Vasquez Rocks. 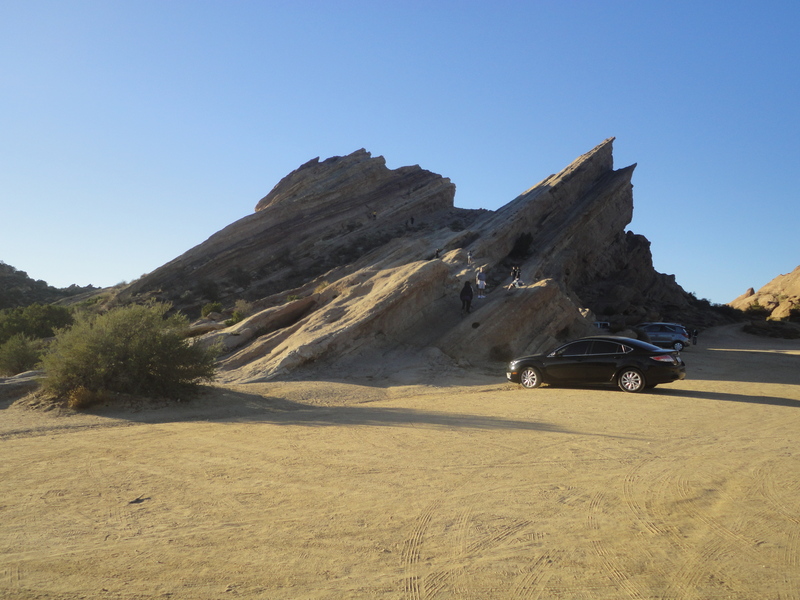 Since we are with a bunch a science nerds, the Vasquez Rocks hold significance as the setting for many famous Star Trek episodes. Some other movies and TV shows were filmed here as well. Because of an awful experience working at a low-power TV station in college, I despise Star Trek, but the geological features were cool to see. Pamela also pointed out the view of SOFIA’s hanger, the aircraft we’ll be flying on, across the openness of the Mojave Desert. We then were taken to our lodging for the week so we could unpack and get acclimated a little. We still have a dinner at 7 pm local time. They said that is by design. Since we will be flying overnight in 2 days, they are trying to get our sleep cycle adjusted. We will get more info at dinner about what our expectations are. Then tomorrow midday, we are visiting the hanger that houses SOFIA to get our first look at it and also tour the flight facility.